I’ve spent the last 3 months in Mumbai, India working for Star Sports and Commentating on Vivo Pro Kabaddi Season 5. After 105 matches it was definitely time for a well earned break ahead of the super play offs and finals. My holiday destination of choice? 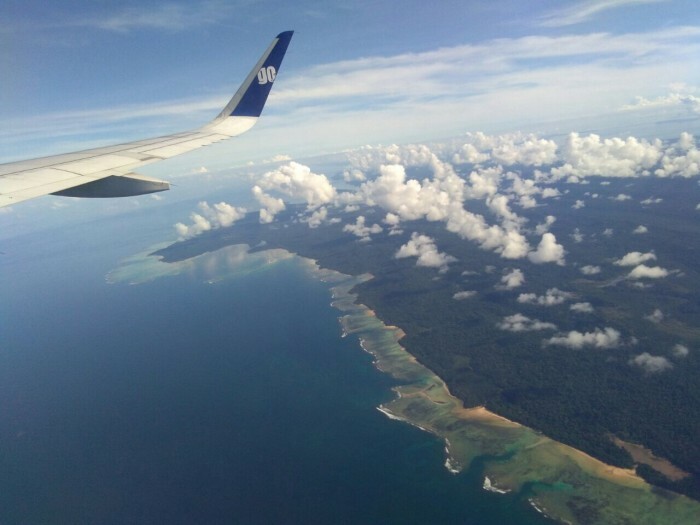 The Andaman Islands. The Andaman Islands are an Indian archipelago in the Bay of Bengal. These roughly 300 islands are known for their palm-lined, white-sand beaches, mangroves and tropical rainforests. 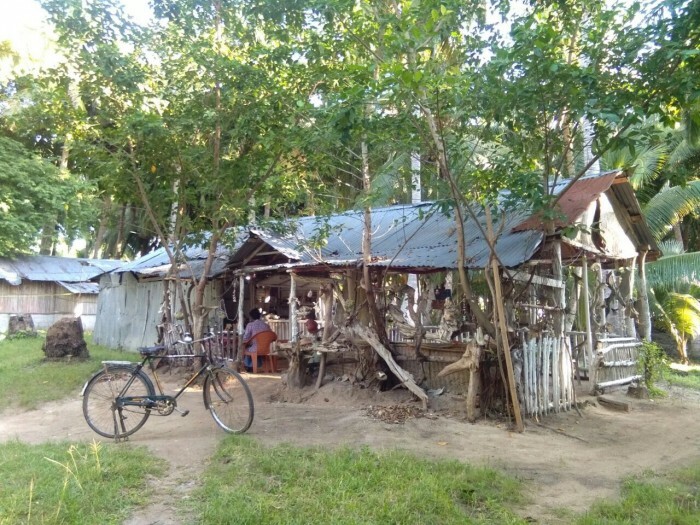 Indigenous Andaman Islanders inhabit the more remote islands, many of which are off limits to visitors. Opted for a punchy 4am flight out of Mumbai to Port Blair (duration 3hrs 10 mins with ‘Go Air’) Landed just in time for a masala dosa breakfast! Incredible view of the islands as you come in to land. Sandy beaches and turquoise blue waters await! 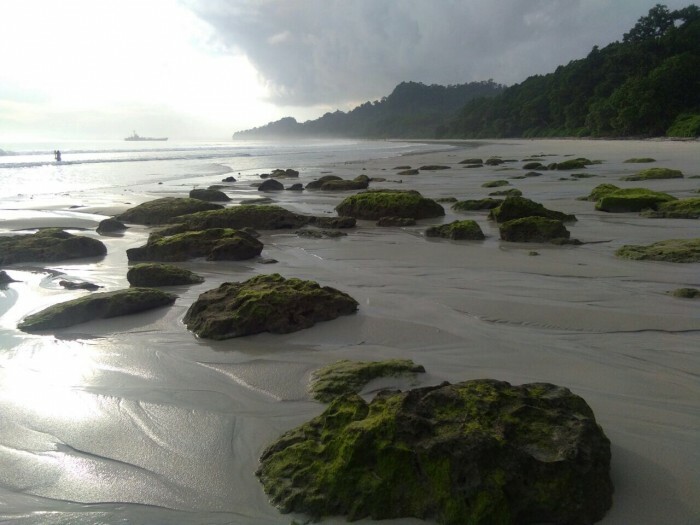 2 of the most popular and accessible islands to visit in The Andaman Islands are Havelock Island and Neil Island. N.B. Be sure to book your ferry to these islands ahead of time to avoid any delays or disappointment. 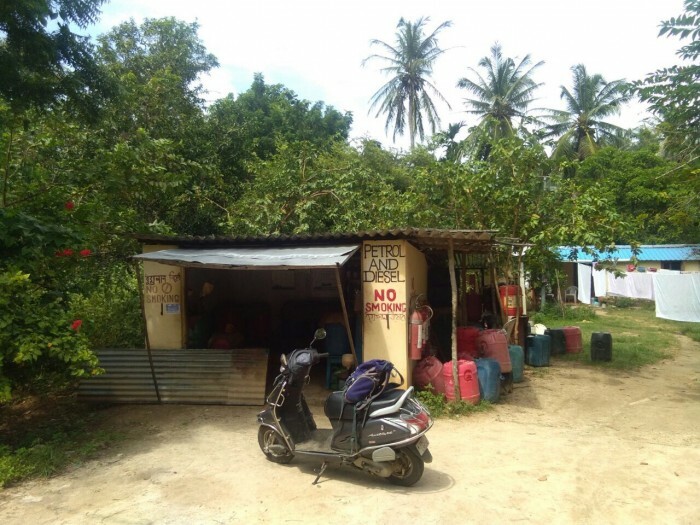 With a booming tourist industry in this remote part of India the competition for places on the ferry is fierce! 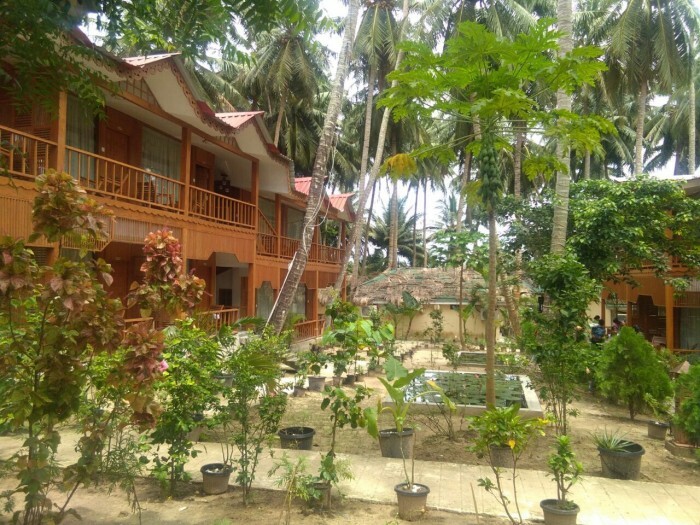 I booked a majority of my hotels and transfers with Andaman Diaries , who I can highly recommend using to take care of all your admin..
My initial plan was to travel on to Havelock Island on Day 1 but unfortunately this simply wasn’t possible. The ferry was fully booked that day. 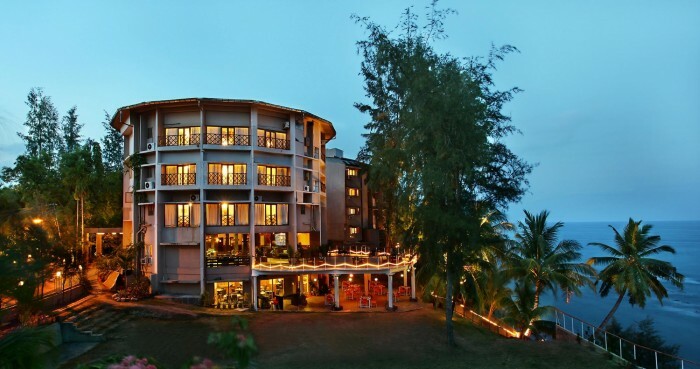 24hrs in Port Blair it is then!! Fairly priced and has one of the best hotel views on the island with a cracking view over the bay to Ross Island. 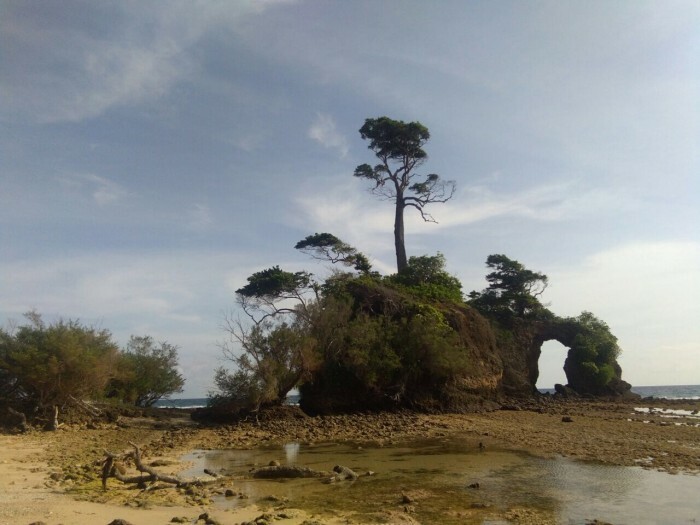 I’m not usually one to follow the tourist trail, but with limited options available to ‘kill time’ I thought I might as well embrace the madness and visit 2 of the star attractions near Port Blair, namely Ross Island and North Bay Island. 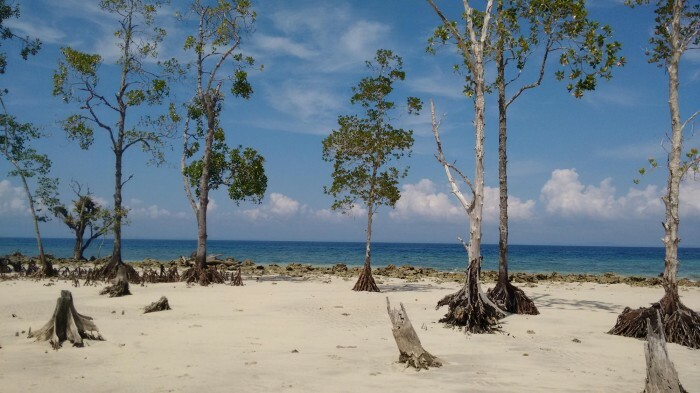 Just a short boat ride from Port Blair is Ross Island. I was definitely a bit synical on my way over, but I’ve got to say on arrival I was pleasantly surprised. 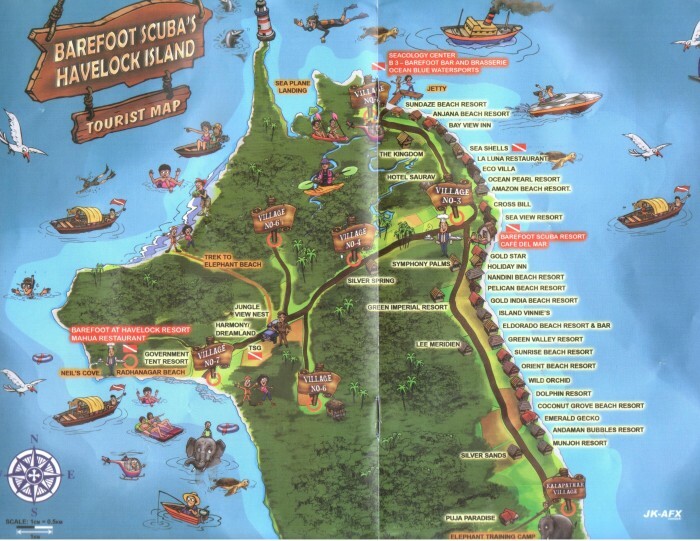 Be sure to stretch your legs and explore the entire island when you get there. It’s only 1.25km in length and 0.50km in width, and you’ll discover some really picturesque parts of the island. The island itself has plenty of history attached to it, having formerly been occupied by both the British and Japanese. 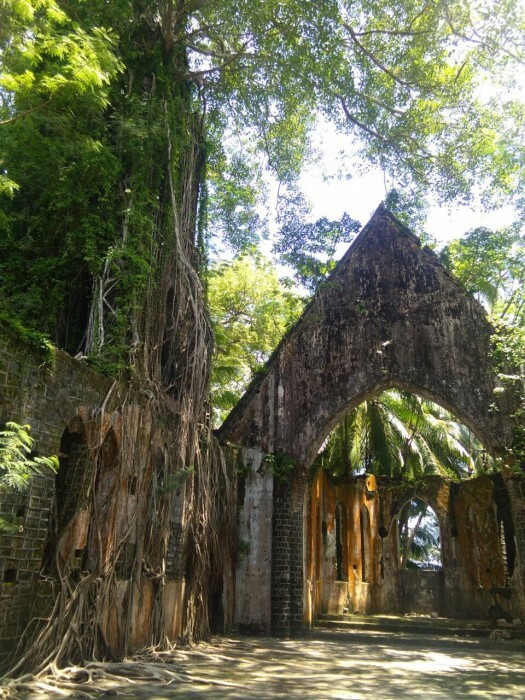 I personally loved how Mother Nature had reclaimed the island back for herself with the lush tropical rainforest weaving its way through the old derelict buildings. In stark contrast North Bay Island was totally under whelming! It’s essentially a “hot bed” for thousands of domestic tourists who flock there to try snorkelling, scuba diving and sea walking for the first time. Total carnage! Not my cup of tea!! The only “shinning light” on the island is the Lighthouse, which you can climb for 10 rupees. Fantastic views back across to Port Blair and Ross Island. Definitely felt they were missing a trick by not charging 20 rupees to climb the Lighthouse as it features on the 20 rupee note. 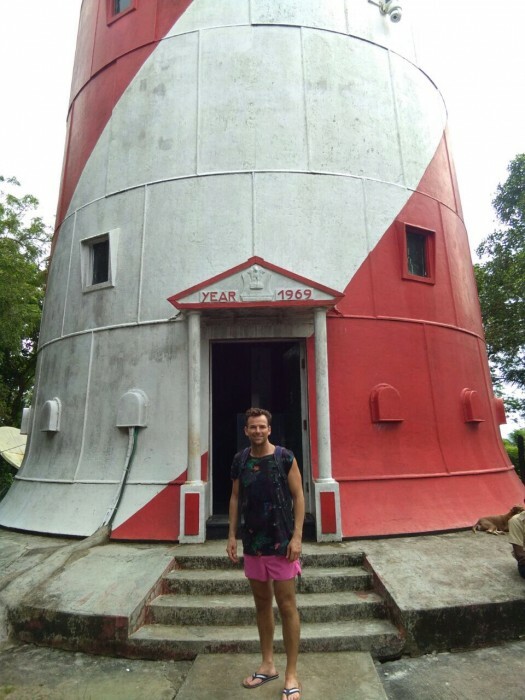 I rounded off day 1 of my holiday with dinner at a local restaurant in Port Blair which was also named ‘Lighthouse’. Grilled tiger prawns and spicy masala fish. Delicious! 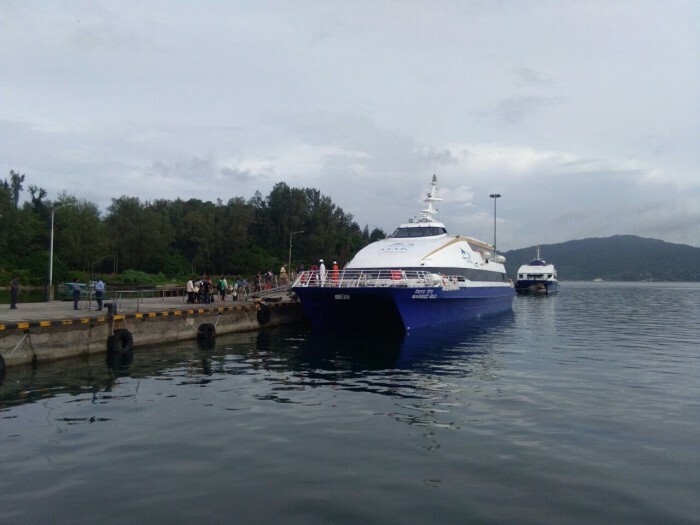 7am pick up to catch the morning Ferry to Havelock Island from Port Blair (duration 1hr 30mins). Tickets are limited and in high demand so best to book in advance or you might find your travel plans delayed. 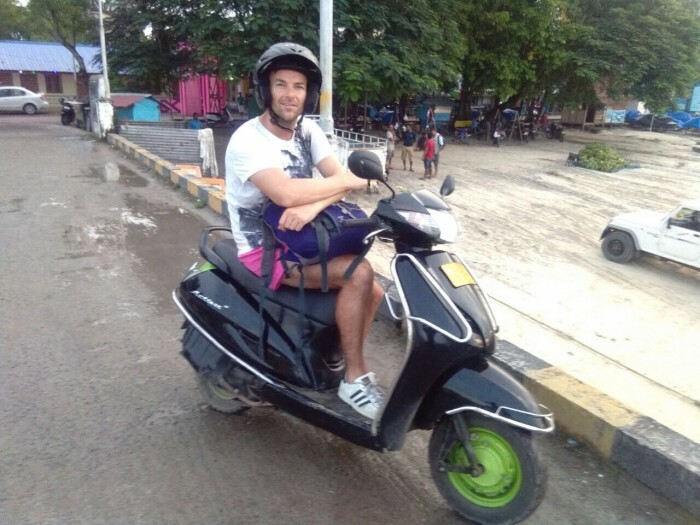 The best way to explore the island is by hiring a scooter (400 – 500 rupees a day). However, if you’re not comfortable riding a scooter then there are plenty of rickshaws around which can ferry you around from A to B. Sadly in this day and age we are all guilty of spending way too much time with our heads down in our mobile phones. We therefore miss out on these moments to connect with each other on a daily basis. Thankfully there’s no wi-fi here on the island, so no chance of that happening this week. Over lunch I met a group of charming Israeli travellers in there mid 20’s who were truly embedded into island life and living in a community of beach side eco-huts. 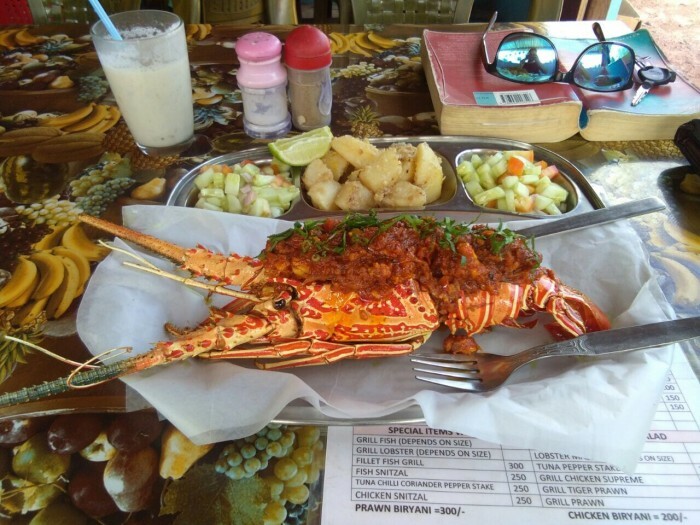 These are readily available on the island but very popular with travellers who are on a shoe string budget. Initially I had thought about doing this, but recognised pretty quickly this particular trip was more about rest, recovery and relaxation. The guarantee of a good nights sleep in a comfy bed, a hearty breakfast and a warm shower in the morning were essential. Home sweet home for the next 3 nights! 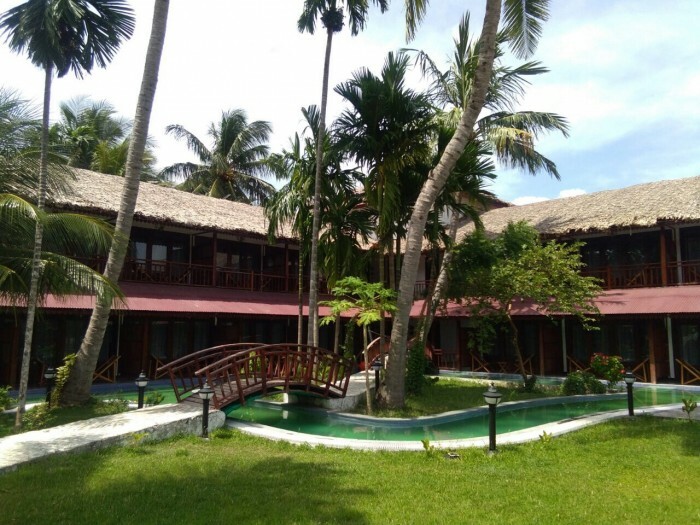 The resort is located at the north-east end of the island and is just a 2 minute drive from the jetty where you arrive on the ferry. 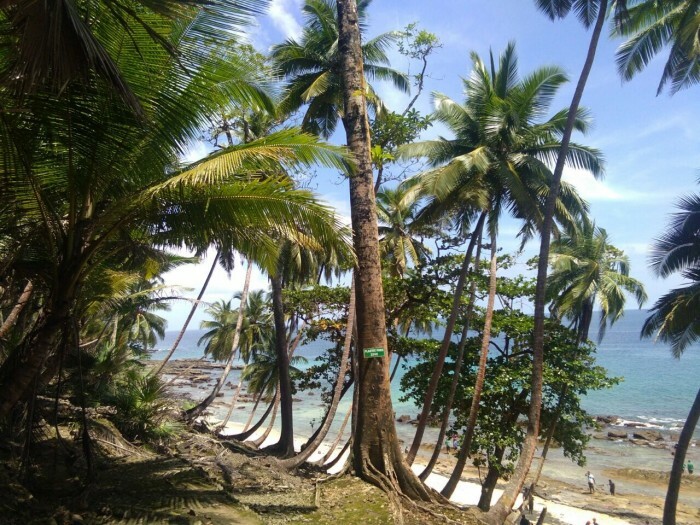 Havelock Island is only 92 square kilometres and there are only 2 main roads, so it’s almost impossible to get lost! 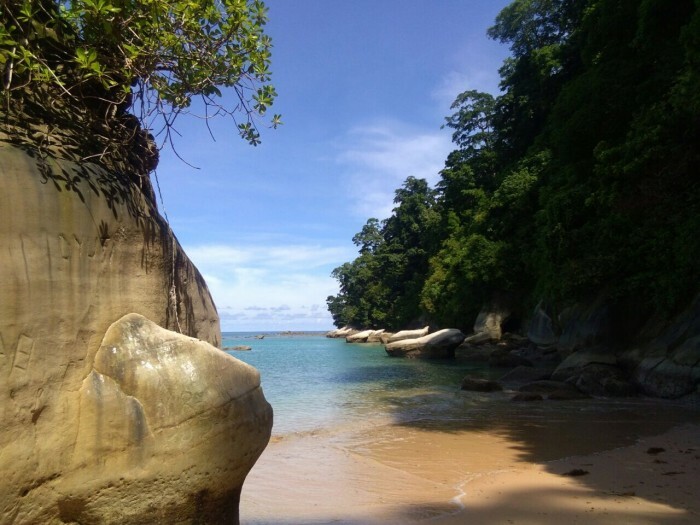 It’s known for its dive sites and beaches, like Elephant Beach, with its coral reefs. 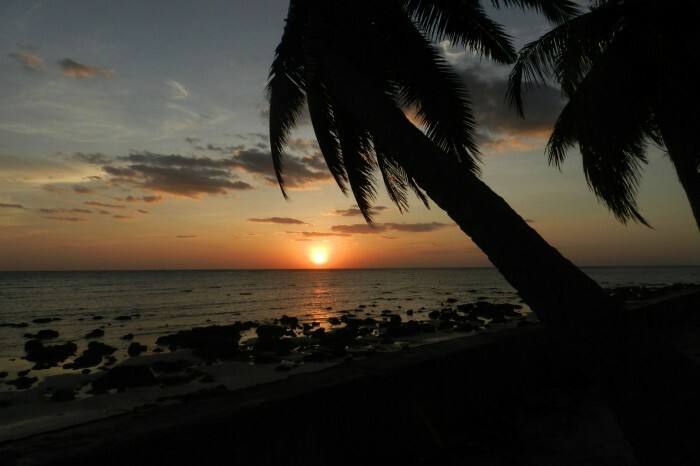 Crescent-shaped Radhanagar Beach (west coast) is a popular spot for watching the sunset. 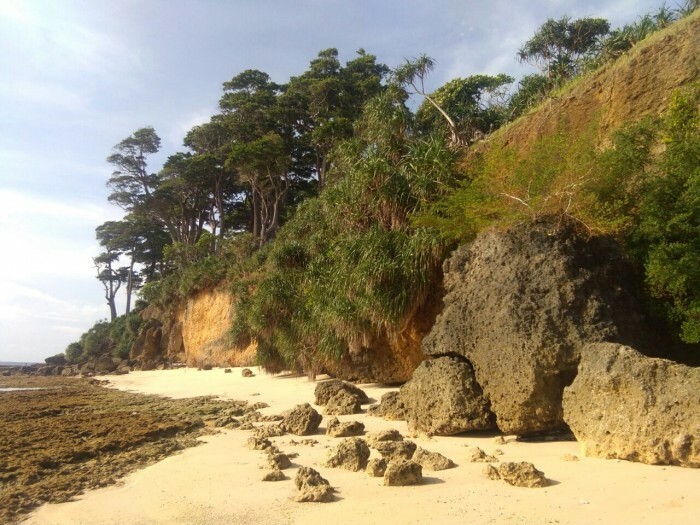 Whilst on the island’s east side, rocky sections mark long, tree-lined Vijaynagar Beach. Top tip: Always head away from the crowd to experience the true beauty of this island and its beaches. Ate lunch at a place called Coco, which is half way down the east coast road. The owner highly recommeneded the mixed tandoori grill (fish, prawns, chicken) followed by the house special banoffee pie. Strong recommendations! N.B. Eat fish at every opportunity on the island. 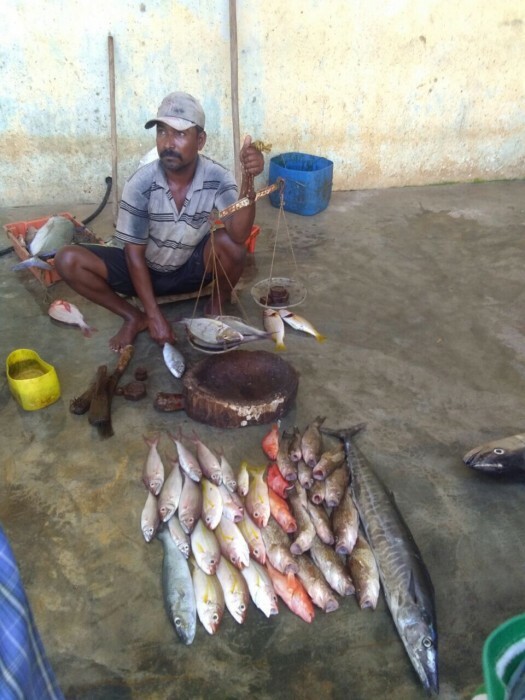 Freshly caught and perfectly prepared. Plenty of healthy veggie options available too. WARNING: Just a quick heads up that there is only 1 bar on the island! 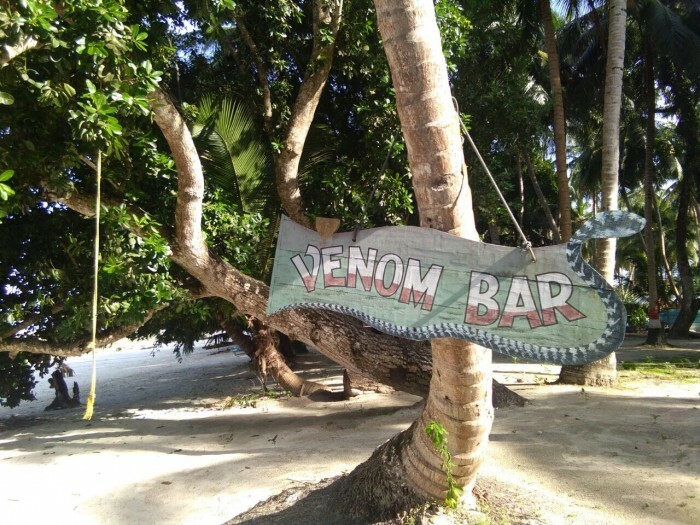 Venom Bar is hidden away at the very back of the “Sympathy Palms Resort”. Happy hunting! Will check this out tomorrow! The early bird catches the worm and the sunrise for that matter! The sun comes up here around 4:45am and it really is the best part of the day and totally worth getting out of bed for. Took a shower after breakfast and opted for the “Bucket and Jug” method instead of the traditional “power shower”. I’d noticed a number of posters up around the hotel that highlighted the importance of water conservation on the island. So I wanted to do my part to save water during this vacation. 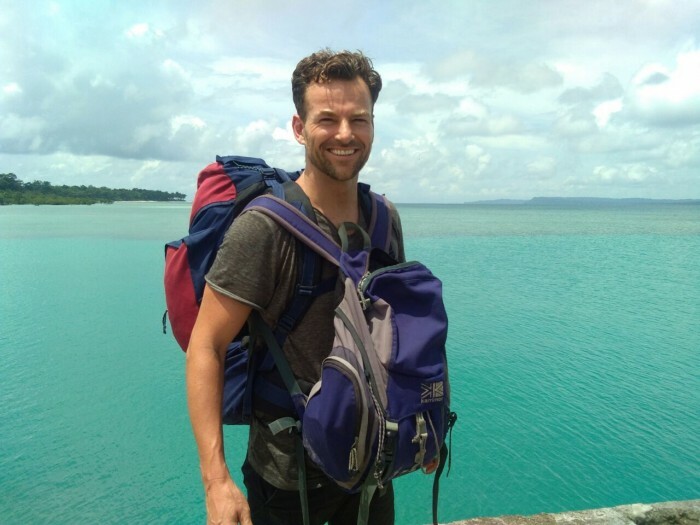 Sustainability on Havelock Island is definitely an area for concern with a booming foreign and domestic tourist market. Important as visitors to the island that we acknowledge this. In fact not only here in India but also across the rest of our beautiful planet. I know pouring a bucket of warm water over your head a jug- full at a time might not sound that glamorous but I can assure you it is just the ticket! Incredibly liberating and somehow you treasure every single drop of water. Maybe because of this awareness the entire experience is heightened? I was very much in my element and content in the knowledge that I was doing my bit to conserve water on the island. Popped into town to have a look around the local market and bumped into 2 familiar faces I had met on Day 1. Roi (Israli traveller who I met over lunch at Coco) and Santosh (American traveller I sat next to on the ferry over from Port Blair). Its funny how the universe has a way of bringing people together. I don’t believe in coincidences. Whether you would like to call it fate, destiny or just karma the 3 of us were destined to meet that morning, in that market, at that time. 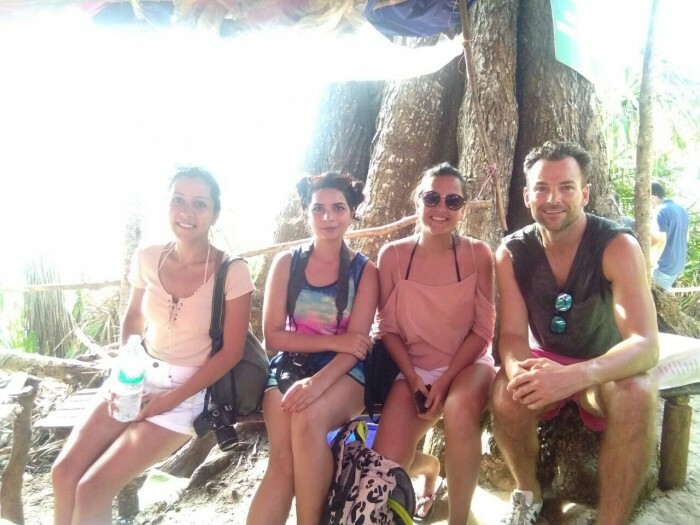 From there we decided to embark on a trek together through the rainforest to a secluded beach called Elephant Beach, which has some of the best snorkelling on the island. 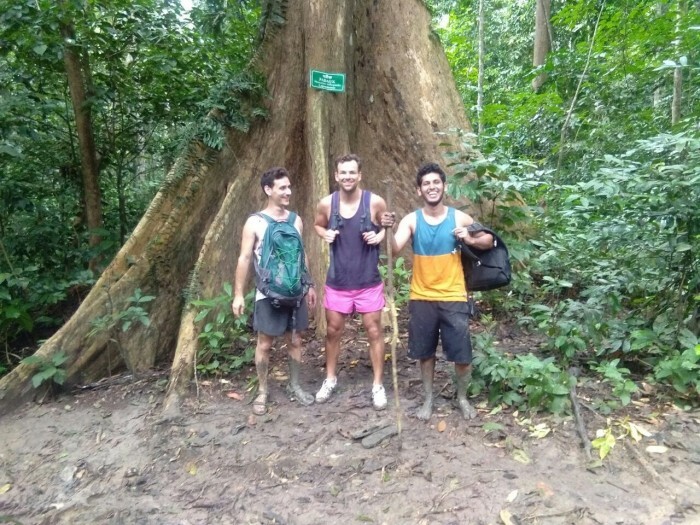 After a muddy 45 minute walk through the wilderness we emerged from the mangrove swamps onto the golden sands of Elephant Beach. We jumped into the crystal clear waters and swam amongst thousands of brightly coloured tropical fish. Please look after this very special area of natural beauty. 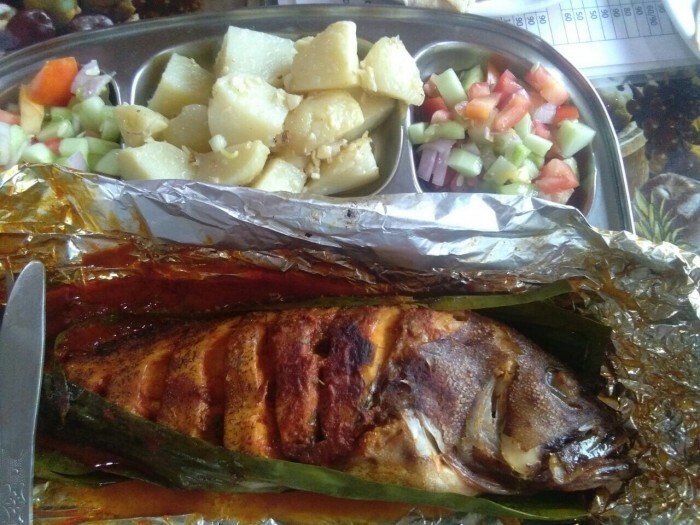 Enjoyed my masala fish with Roi & Santosh and reflected on our little excursion, even made a few more Israeli friends, who invited us to celebrate ‘Sukkot’ with them later that night. A tropical rain storm followed lunch and I reflected on just how much I love the simple life. We definitely make life more complicated than it needs to be! Do we hold ourselves hostage with our work, relationships and ambitions? Why can’t we just be happy with what we’ve already got? What is it that makes you truly happy? I mulled these questions over in my head whilst watching the rain come hammering down. I tried to answer them as honestly as I could and drew multiple conclusions. 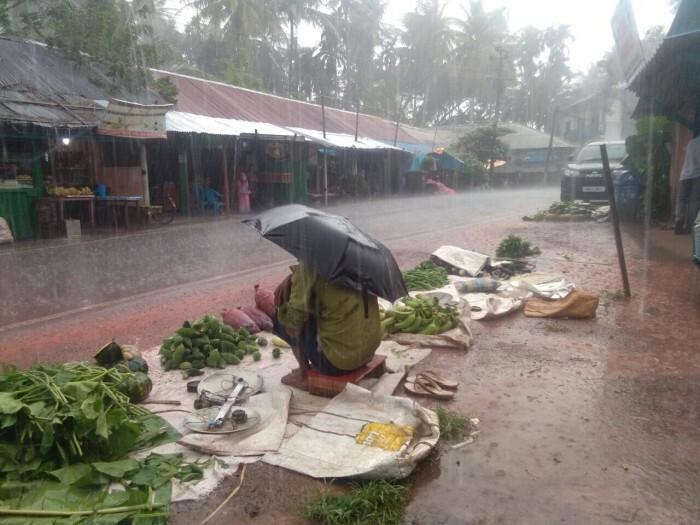 I then noticed a local man selling vegetables at the side of the road, taking shelter from the heavy rains under his umbrella. He sat there patiently waiting for the storm to pass and for his customers to return. This is what ‘the simple life’ looks like. The rain eventually stopped, he took his ‘brolly’ down and he flashed me a warm, friendly smile in the process. This smile told me everything I needed to know. Here was a man who was happy, fully content with his life. India is full of men, women and children like this. Our society has much to learn from people like this. Absalom or Avshalom (Hebrew: אַבְשָלוֹם, Modern Avshalom, Tiberian ʼAḇšālôm; “Father of peace”) according to the Hebrew Bible was the third son of David, King of Israel with Maacah, daughter of Talmai, King of Geshur. So somewhere down the line I must be related to these guys?! We ate very well, then we sang, and then we drank whisky late into the night. I was amongst family! Venom Bar finally managed to get its ‘poison’ into our veins, and we ended up dancing on the beach under the full moon until the early hours. Owch!! Mega Hangover!!! I am definitely not a whisky drinker! When will I learn? Just relaxed on the beach today and enjoyed doing absolutely nothing. What a treat! That’s what this week is all about. Switching off from work life and embracing each and every magical moment… even if that magical moment feels like a pneumatic drill boring its way through your skull!! 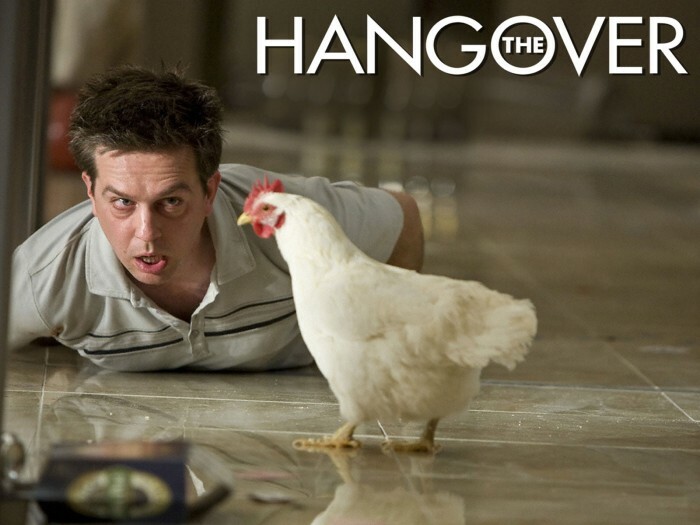 Happy Hangover! Re-visited ‘Welcome Restaurant’ for lunch and tried the Lobster Masala this time, which was incredible (only 800 rupees). Not bad for a tenner! 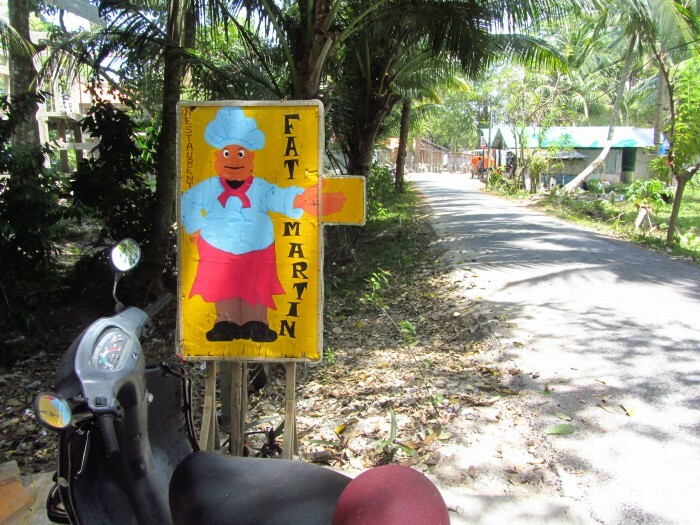 After some more recovery time on the beach, reading my book (Shantaram by Gregory David Roberts) I jumped on my scooter and whizzed over to an internet cafe called “Fat Martin’s” – a very popular hang out for foreign travellers and also does excellent food. I presume that’s why Martin is so fat?!! It’s touch and go with the internet in this part of the world and it was a welcome relief to discover it was ‘out of action’ today. Bumped into a few familiar faces from last night and decided to hang out over dinner. 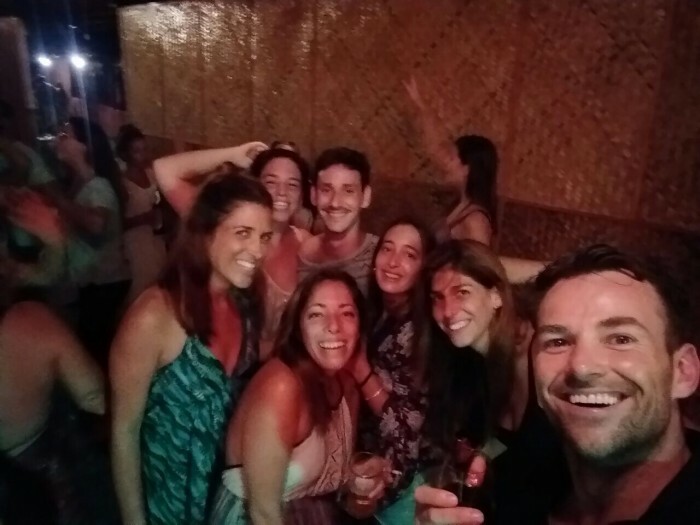 We shared stories from our crazy whisky fuelled night out and it was a welcome relief to hear I wasn’t the only one who’d been feeling ropey all day!! After dinner we re-located to Coco’s for dessert, where we ordered one of everything on the dessert menu! This is me at my happiest! Despite looking like a seasoned backpacker I had actually booked in for 3 nights at the Summer Sands Hotel, a relatively new hotel on the island which sprung up about 10 months ago due to the increased amount of tourists visiting. It’s a bit pricey, but very comfortable. Creature comforts: Air conditioned rooms, Pool, Bar, Internet, TV, Restaurant etc. 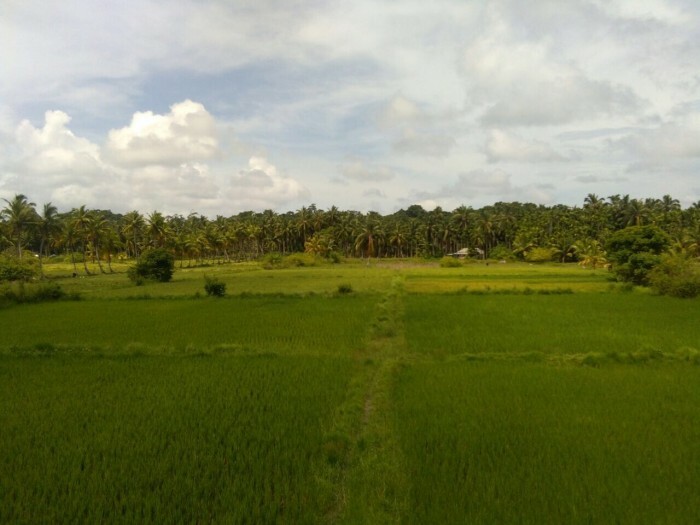 The view from my room across the rice fields to the tropical rainforest. You will definitely need to hire a scooter/bicycle to get around the island. Rickshaws are available too, but these mainly operate from the port. Having your own set of wheels just gives you a little more freedom to explore the island. Don’t forget to fill up with petrol though!! Filling up at pump number 1! Bumped into 3 lovely young ladies from Delhi today who kindly invited me to join them on their island tour, which they were doing by bicycle! Very impressive considering it was at least 29 C.
So off we headed to Islands star attraction “The Natural Bridge”. This is where all the BDT’s (‘bloody domestic tourists’ as the girls referred to them!) head straight to from the ferry. 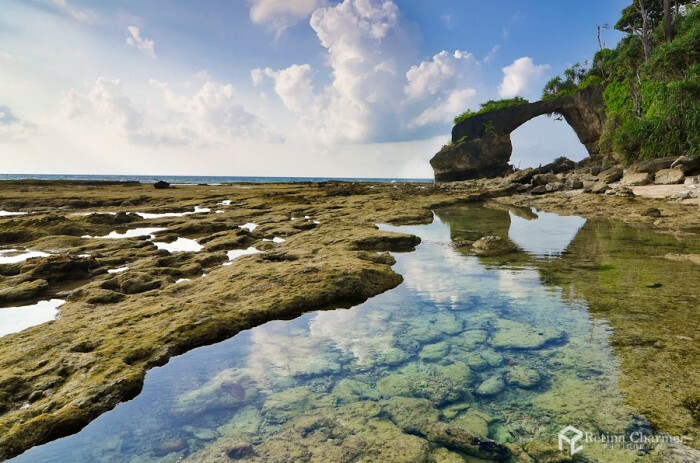 Be sure to step away from the crowd to fully experience the beauty of these naturally weathered coastal landforms. Great part of the island to explore. Travelling alone can sometimes provide you with too much “reflexion time” and I certainly felt I could do with a break….from myself!! 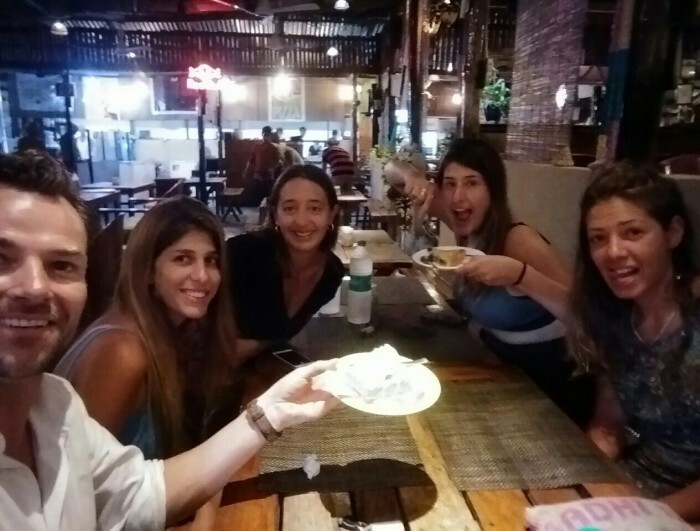 So I was very grateful for the invite from the girls and thoroughly enjoyed their company and their travel stories. Turns out it was one of the girls (Sidak’s) birthday as well. Naturally it was only polite to arrange a little birthday celebration that evening back at the hotel, where they even managed to provided us with a birthday cake! 4:45am – Early start to see the sun rise at Sitapur Beach. 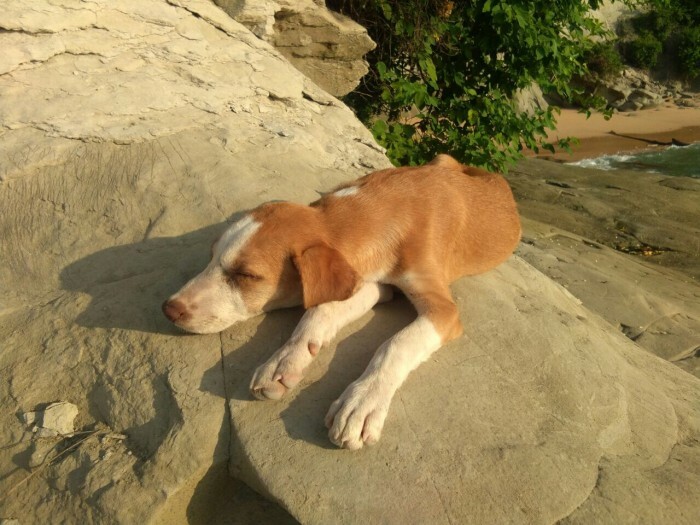 Did some yoga and mediation on the beach and made friends with a little puppy who didn’t leave my side all morning. Had to lift him over the rocks on the way back as the tide was coming in and he wasn’t a very confident climber! FACT: There are more dogs on Neil island than people! Population is approx 7,000 people. 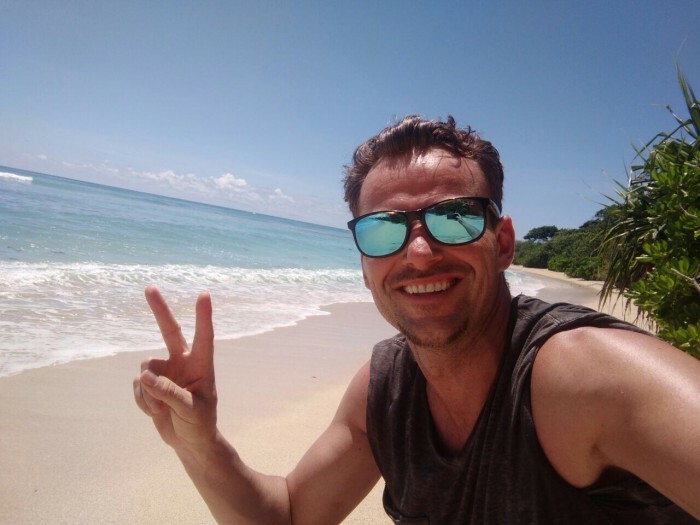 Went big on a delicious south Indian breakfast back at the hotel then headed over to the main beach by the port, which has some of the best swimming on the island. 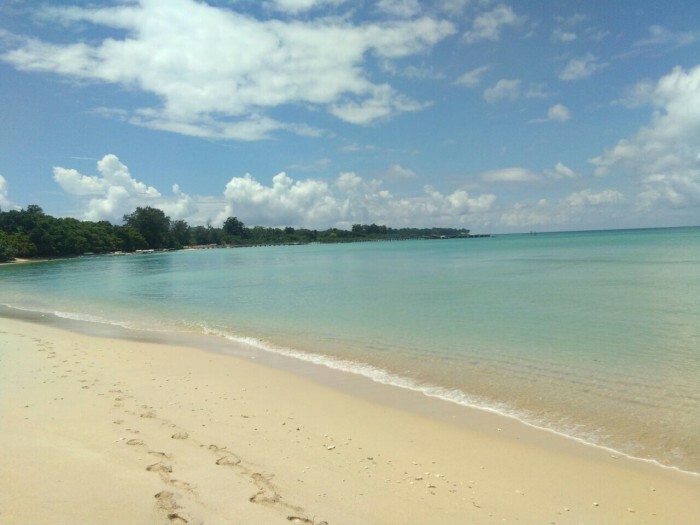 The water can get very shallow though, not just here but on all the beaches on the island. So do keep an eye on the tides and ask one of the locals for the best times to take a dip! Stumbled across a little gem of a place for lunch called “Blue Ocean Restaurant”, which was just up the road from my hotel. It’s run by a lovely Indian chap called Balail, who was very happy to rustle up some garlic, chilly prawns & fish for me in his kitchen. Over lunch Balail told me there were only 7 foreigners (including me) staying on the island this week. It’s a small island so good news travels fast!! Met another one of those 7 foreigners over lunch, a German traveller by the name of Anya who was on her 4th visit to the island since 2011. After lunch we played backgammon until the sun came down and the mosquitos came out! Had dinner back at the hotel and went for one of my stable ‘go to’ meals… Tandoori Prawns & Garlic Naan. 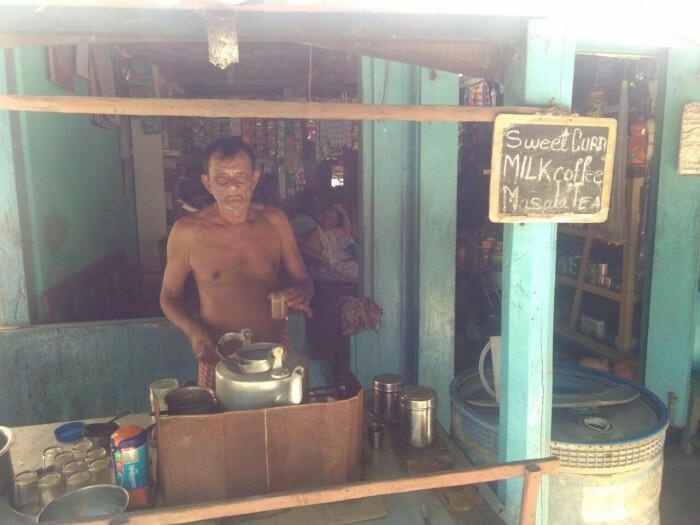 Note to self: I love the simplicity of island life. There’s a real sense of freedom here. I don’t feel like I’m a hostage to the outside world, whether that be my job or my mobile phone. Re-assuring to know it’s possible to shut yourself away from ‘the outside world’ and focus on the simple things in life. 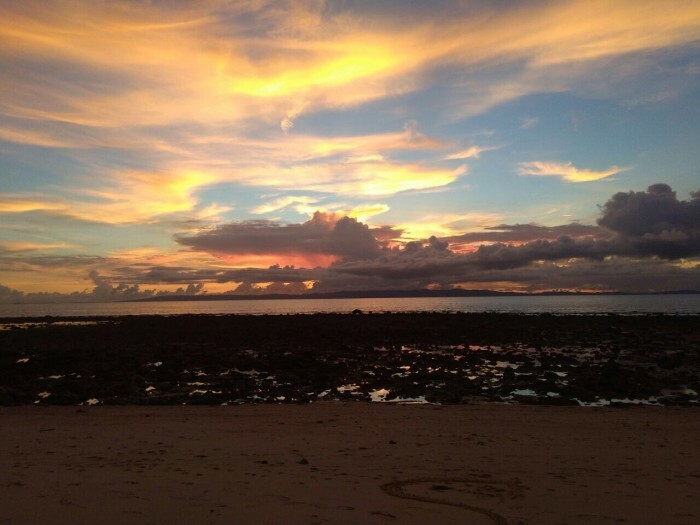 Like watching the sun rise, trekking through the rainforest, reading a book, stopping for chai, swimming in the sea, washing with bucket of water, and watching the sunset. All of which have become part of my daily routine. I’m on a dessert island in the middle of nowhere and it’s all the simple things that make me feel most happy. The day feels full of opportunity and there’s very little to stress about. Remember this feeling. 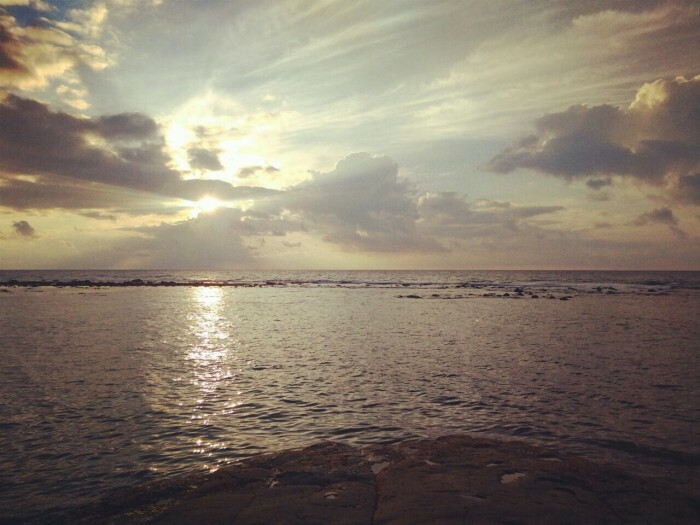 Spent a couple of hours here just swimming in the sea and jumping off the rocks. 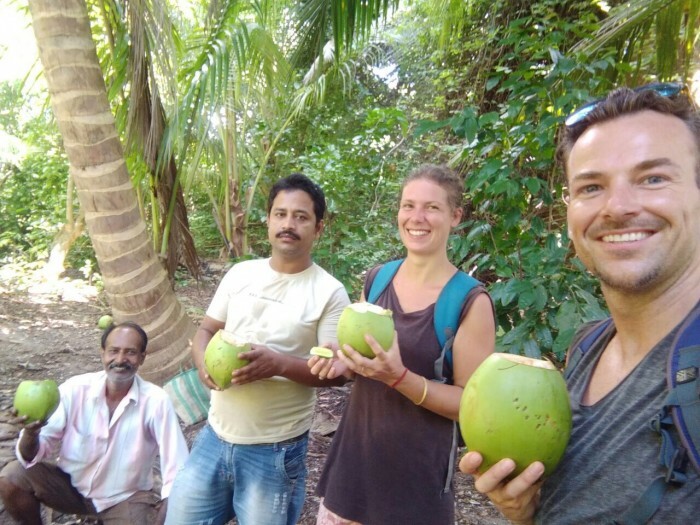 Worked up a real thirst and thankfully there was fresh coconut water available in the forest to quench our thirst. Uncle, Balail, Anya and Michael. 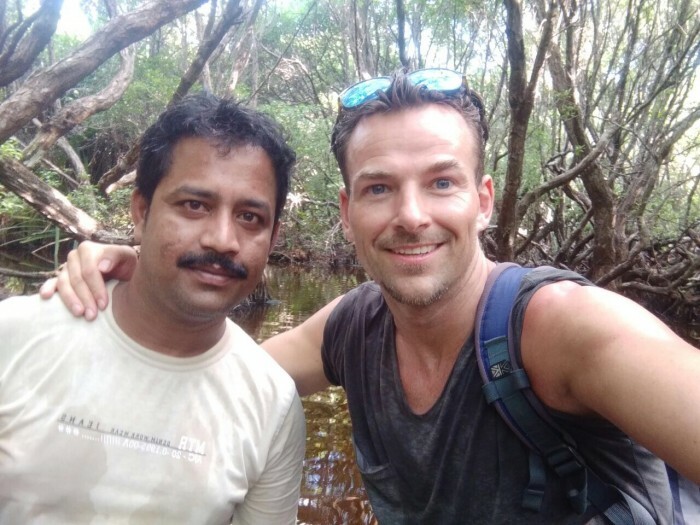 The trek back was a little more exciting through the mangrove swamps and I was 90% sure I was going to get eaten by a crocodile!! Having survived the swamps we were rewarded with some fresh, warm samosa’s back at Blue Ocean Restaurant, which we polished off with a bottle of red wine that I’d managed to purchase from my hotel. And how about this for a magical finish to my holiday? 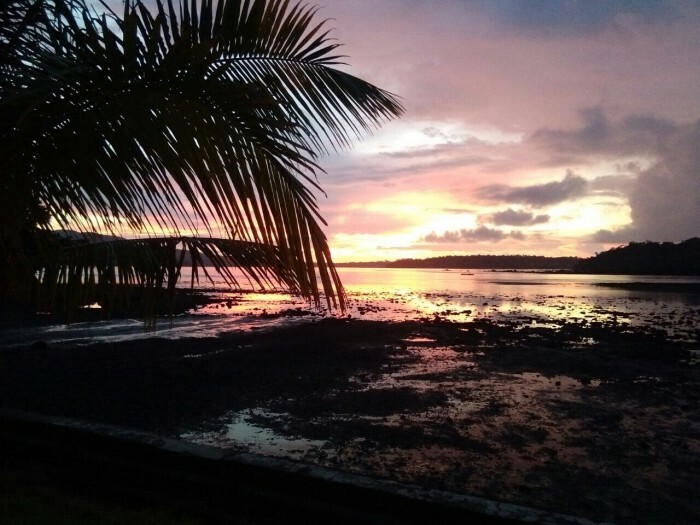 An incredible sunset followed by a slap up meal of barracuda at a restaurant called Garden View. Could happily have spent another couple of weeks here on Neil island. Caught the morning ferry back to Port Blair and the craziness of everyday life consumed me almost instantly. My ‘spider senses’ were overloaded with the sheer volume of cars, people and all-round craziness that surrounds us in our every day lives #cultureshock. Still an extra day here in Port Blair certainly helped me to acclimatise back to the magical manic madness of Mumbai. Thanks to ‘Andaman Diaries’ Team who arranged all my accommodation and transfers. They even took me to see one final sunset just outside Port Blair, followed by chai, dinner and a box of homemade Indian sweets. Thank you. Had a great time and highly recommend your services. Enjoyed a cold Kingfisher beer and a light bite at ‘The Love Bar’ in Hotel Shompem- Tandoori Chicken & Garlic Naan – Standard!! 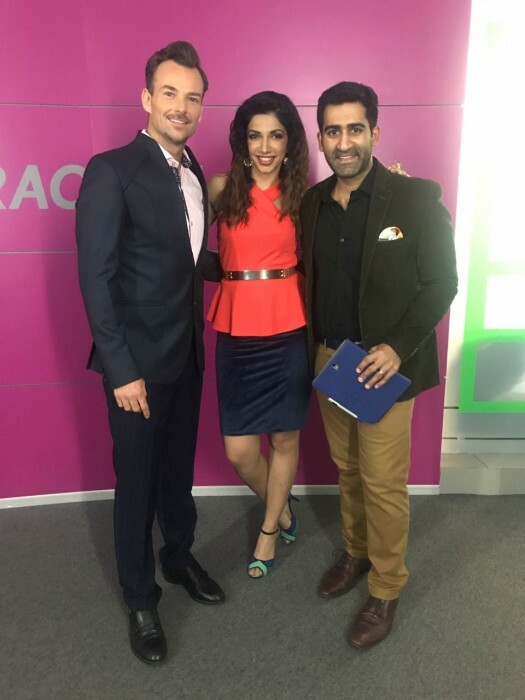 Hello Commentary Box – Back to the day job Hosting ‘Vivo Pro Kabaddi’ on Star Sports. 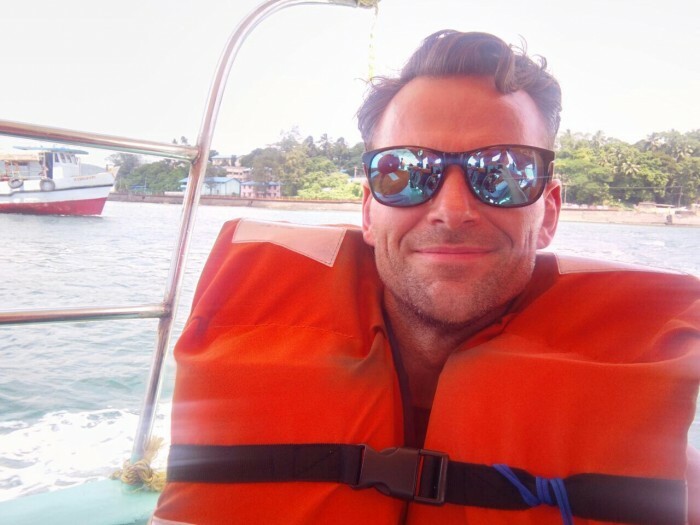 Travelling alone is an incredibly rewarding and enlightening experience. At times it can feel a little bit scary and a little lonely, but ultimately it gives us an opportunity to grow and learn little more about ourselves. What makes me tick? What are the things that matter most to me in my life? What sort of person am I? What do I still want to achieve with my life? 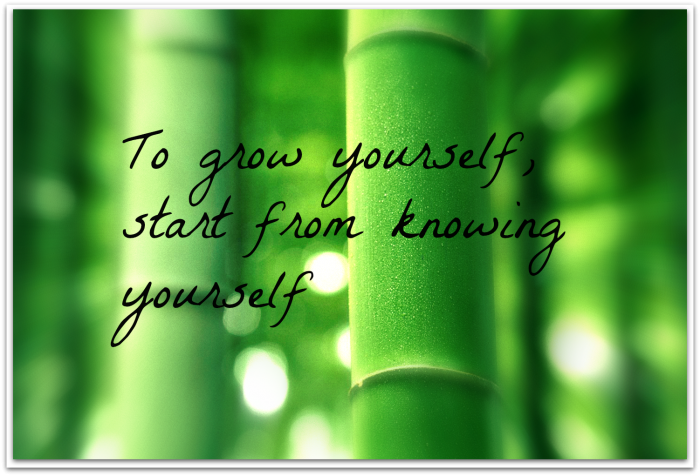 For me, life is all about personal growth and development. Travelling certainly gives us plenty of opportunity to do this. I believe we should constantly be evolving, making daily improvements to our lives and trying to become the best possible versions of ourselves. Remember these opportunities to grow ourselves present themselves every single day, not just on holiday!